In Verde Pino with a tan cloth interior. 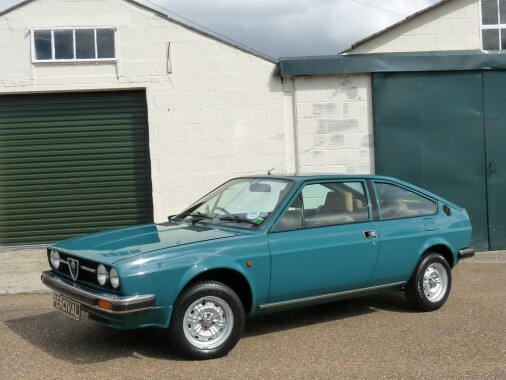 Only 42,000 miles is receorded on this Alfasud Sprint and the history file and lack of wear appears to substantiate this. It is in rare Veloce form and has a 1.5 litre four cylinder Boxer engine with a five speed gearbox and two twin choke carburettors. Having not driven one of these fantastic cars in nearly thirty years, I had forgotten how freely the engine revs and how beautifully they ride. They go like the clappers too especially in Veloce spec like this car. It has a Pioneer radio cassette player, the original parcel shelf, the correct radio radio cassette player and remains in original, unmodified specification. It has recently been lightly restored including the fitting of New Old Stock front wings and is in superb condition. Very, very rare in early, stainless bumper form and even rarer as a Veloce.